we will speak our own minds. 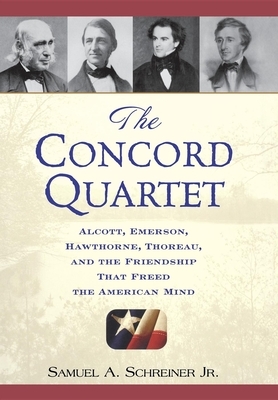 ""Beginning in the 1830s, coincidences that seem almost miraculous in retrospect brought together in Concord as friends and neighbors four men of very different temperaments and talents who shared the same conviction that the soul had 'inherent power to grasp the truth' and that the truth would make men free of old constraints on thought and behavior. In addition to Emerson, a philosopher, there was Amos Bronson Alcott, an educator; Henry David Thoreau, a naturalist and rebel; and Nathaniel Hawthorne, a novelist. This book is the story of that unique and influential friendship in action, of the lives the friends led, and their work that resulted in an enduring change in their nation's direction."" Samuel A. Schreiner Jr., a veteran journalist and former senior editor at "Reader's Digest," is the author of both novels and nonfiction, including "The Trials of Mrs. Lincoln, Henry Clay Frick: The Gospel of Greed," and "The Passionate Beechers: A Family Saga of Sanctity and Scandal That Changed America." He lives in Darien, Connecticut.